We all know the names of the major cruise lines. Royal Caribbean, Carnival, Norwegian, Princess, MSC, etc. However, below are five cruise lines that we've all seem to have forgotten about. Festival Cruises was originally founded by George Poulides in 1992. Festival was a Greece based cruise line that used second-hand ships. They began operating in 1994 after purchasing the MS Azur originally from Chandris Cruises (pictured above). In 1995 they acquired the MS Steward from Norwegian Cruise Lines, renamed it the MS Bolero. They finally received their third second-hand ship, the MS Southern Cross from Premier Cruise Lines, before placing an order for their first newly built ship in 1999. Later in 2000, Festival Cruises announced that they would merge with Peninsular and Oriental Steam Navigation Company, P&O. However, the merger was abandoned a year later due to the low value of cruise line shares. Festival had two more new ships built like the MS Mistral in 2001 and 2002. These two ships, the MS European Vision and the European Star, were later sold to MSC Cruises in 2004, when Festival Cruises went bankrupt. All of Festival's other ships were also auctioned to other cruise ship operators. Premier Cruise Line was founded in the early 1990's by Kristian Stensby. The cruise line was focused on the family cruise market. Premier's business focus was to acquire older cruise ships and refurbished them to offer "traditional cruise experiences." The initial geographic focus for Premier was Europe, South America, and Central America, in which the major cruise lines (Norwegian Cruise Line, Carnival, and Royal Caribbean) were not sailing to at the time. From the beginning of the cruise line, Stensby grew the line from one to six ships that operated out of Port Canaveral and Miami. Stensby later resigned in 1997, after growing the company to an annual revenue of $200 million. The company began to slowly decline after Stensby resigned. Stensby's successor, Bruce Nierenberg, changed the marketing strategies and decided to cancel marketing agreements with international marketing partners, such as Thomson Holidays and Pullmantur. A few of these marketing partners took the opportunity to start their own cruise lines. Pullmantur Cruises and Thomson's TUI travel group were later bought by Royal Caribbean. In 2000, Premier Cruises filed for bankruptcy and ceased operations after just three years without Stensby. The White Star Line was a very well known British shipping company in the late 1800's and early 1900's. The line was founded in 1845 in Liverpool, England. They had a fleet of mainly clipper ships that sailed to Britain and Australia. White Star acquired its first steamship, the Royal Standard, in 1863. At this time in history, many people began to immigrate and emigrate to Europe, Canada, and the US. The White Star Line was one of the first shipping lines to have passenger ships, which were used by these people. They began operating their Oceanic-Class ships in 1870. On April 15, 1912, the most famous cruise line accidents occurred. The White Star Line boasted that the Titanic was unsinkable. During her maiden crossing of the Atlantic Ocean, she hit an iceberg and sank. One thousand-five hundred-two passengers and crew went down with Titanic that faithful night. In 1933, The White Star Line was in serious financial trouble due to the Great Depression. The British government agreed to help the line under the condition that Cunard and White Star merge their North Atlantic operations. They agreed and was made official on December 30, 1933. They called themselves Cunard-White Star Limited until 1947, when Cunard acquired the part of the line that they didn't already own. The name was reverted back to Cunard on the first day of 1950. 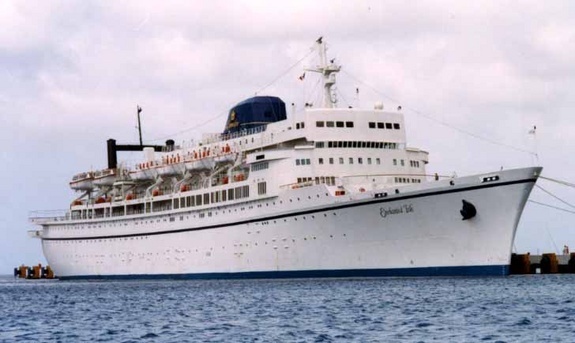 Crown Cruise Line was a small, upper class cruise line founded by Oddmund Grundstad in 1984. Their first ship was called the Viking Princess and originally sailed out of San Diego, California, to Ensenada, Baja California and Santa Catalina Island, California. After the cruise line reached an agreement with the Port of Palm Beach, Florida, the Viking Princess was moved and sailed one day sailings to Freeport, Bahamas. 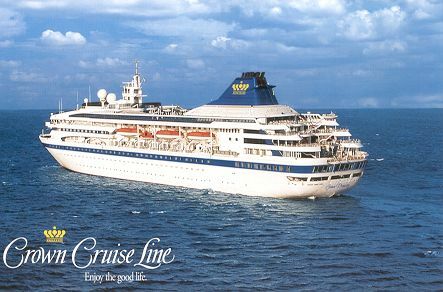 Later, in 1986, Crown purchased a second ship from a Spanish shipping line, that was refitted to be a cruise ship. A 45,000 square foot cruise terminal was finally built for Crown Cruises at the Port of Palm Beach after a third ship joined the line. The reasons for the decline of Crown Cruise Line were the recession and the Gulf War in 1991. These affected consumer spending for cruise vacations. As a result, the line had to scale back its operations. The line was split into two lines by their parent company, Grundstand Maritime, and [art of it became Palm Beach Cruises. The other part was sold to Commodore Cruise Line. Crown Cruises had a total of five ships before the line fell apart. The ships were leased to other operators, and the line ceased to exist in 2001. Commodore Cruise Line was founded in 1966 by Sanford Chobol and Edwin Stephan. Commodore was founded the same year as Norwegian Caribbean Line (now Norwegian Cruise Line). The line reached an agreement with the Wallenius Lines to acquire the build contract for a half-finished ferry that was originally under construction for the Sweden-based ferry company, Lion Ferry. Commodore Cruises became the first ever cruise line to operate week-long cruises out of Florida year-round. The company acquired more ships after it was bought by Rederi Ab Sally. However, in 1987, Rederi Ab Sally was sold to two of its competitors, Effoa and Johnson Line. Effoa and Johnson Line later merged to become EffJohn. Later, EffJohn decided they would merge Bermuda Star Line into Commodore. This allowed them to acquire even more ships. Commodore was sold to JeMJ Financial Services, who continued operations in 1995. Sadly, in January of 2001, after facing fierce competition, Commodore Cruise Line filed for bankruptcy.